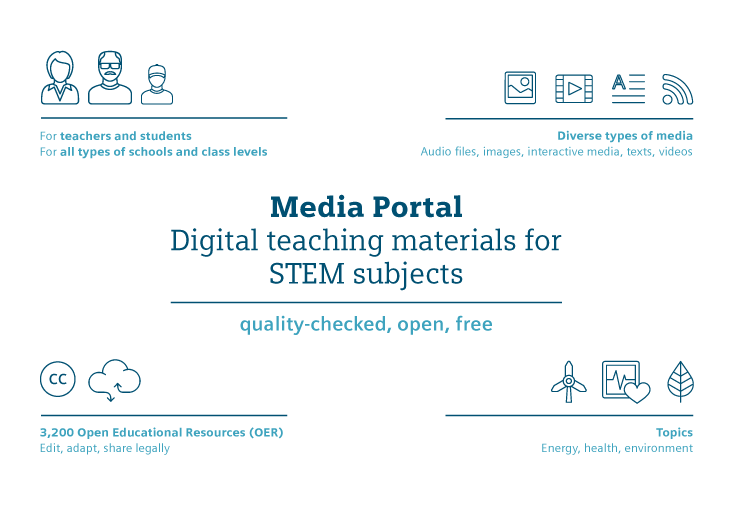 At the Media Portal, teachers can find more than 3,500 open educational resources (OER) for a diverse, exciting STEM classroom experience. Nearly all the teaching materials are available under the CC BY-SA 4.0 international open license. That means they can be used, modified, combined, and shared under the same licensing terms with attribution to the author. We offer students interactive educational media in their own student area. There they can find experiments, puzzles, tests, educational games, and explainer videos for learning or to use in presentations. Our teaching materials appropriate for use in all types of schools and class levels, provide insights and inspiration on the subjects of the environment energy, and health. 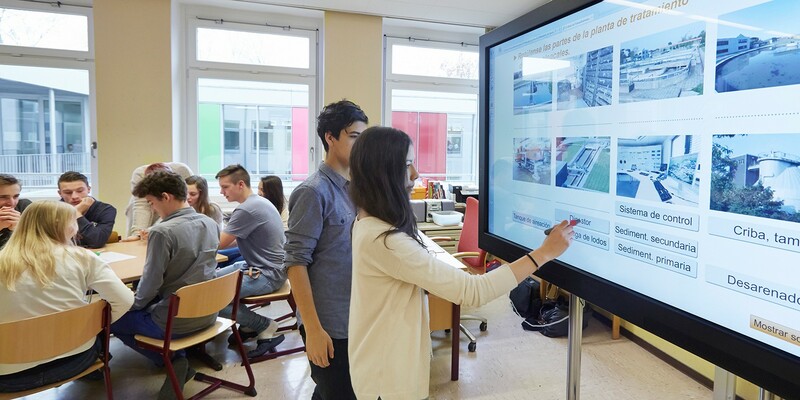 Currently, 45,000 people from 120 countries are making use of the diverse media types – from worksheets to content packages for interactive whiteboards to exciting educational games. The Media Portal and its materials are provided in three languages: English, German, and Spanish. Our method pages present modern teaching methods such as Research-based Learning, Cooperative Learning, and Inclusive Learning – together with examples of how our media can be used effectively for good educational results. Our news section keeps you up to date on interesting events, portals, and the latest developments from the world of OER. The main page also regularly features a “tip of the month” and suggested media for current events. Go here to quickly register for free to use the advanced features of our Media Portal: Create personalized bookmark lists, share teaching materials, or subscribe to the newsletter. The Siemens Stiftung offers the Media Portal with the hope of providing more people around the world with free access to high-quality STEM education. That’s why we turn to open educational resources (OER). These media have been reviewed to ensure their high quality and can be edited. They help teachers present a diverse, real-world-oriented classroom experience. OER can also be adapted to the cultural and educational needs of various regions and to the individual requirements of the students. This aspect is increasingly important, given the growing diversity of classrooms. And by systematically investing in OER, we as a foundation are doing our part to create more equal access to education and opportunity. We launched the Media Portal in May 2009. We make the portal and its teaching materials available in English, German, and Spanish in order to reach a wider global audience. Drawing inspiration from UNESCO’s call for “education for all,” we have been moving entirely to OER since 2012. The relaunch in April 2018 introduces not only a greatly simplified user interface but, most importantly, unrestricted access to the media – even for unregistered users. Our vision for the future is a globally connected community in which users of various countries talk about educational content, create their own media, and share their results and experiences with one another. When creating our materials, we leave nothing to chance. The demand for high quality, social relevance and digital potential of content runs through our processes from the selection of topics to the final medium. We are careful to ensure that our teaching materials offer a high level of quality in terms of both subject matter and educational purpose. We have built up a network of authors from schools and universities to helps us achieve this, lending their domain expertise and their understanding of teaching techniques and methodologies. We collaborate on projects with recognized partners and experts to continually develop new content, methodological approaches, and educational ideas. Our STEM media offerings are aligned with various curricula and include modules for the environment, energy and health. At the same time, we address socially relevant issues that have not yet found their way into the classroom, such as the effects of new technologies on the social fabric or the issues surrounding sustainability. Digital technologies have tremendous potential for how we learn and teach. Our teaching materials encompass various modes (auditory, visual), favor interactive formats (multiple choice, interactive puzzles, memory games), and utilize the opportunities of digital media (through simulations, etc.). The pace and content of the learning experience can be adapted individually to each classroom. All our media are available under the widespread standardized licenses from Creative Commons see also Useful information about OER. What’s important here is that the teaching materials can be modified and adapted to various target groups and learning objectives. This enables co-creative work models, including collaborations between teachers and students. We carefully screen all the sources to ensure there are no legal obstacles. The meta data of all materials includes information on the rights granted, the name of the author, and tips on source references. We seek to offer a wide array of media types, content, and practical methodologies in order to serve as many teaching and learning models as possible. In addition to media for independently developing lesson plans, the portal also offers media to assist with experimenting, practicing, monitoring progress, and presenting. Teachers can use the content to prepare or design their lesson plans. The media are modular in nature, so teachers can use them as they best see fit. Many media also include learning objectives and tips for use. The Media Portal is integrated with many other platforms, media centers, and educational forums. Smart indexing also ensures that our media can be easily found from other portals. Thanks to shared interfaces, users from other portals do not need to switch platforms to use our media.